Wouldn't you rather store your embroidery thread on these funny cardstock bobbins instead of snarled up in a ziplock bag? I think you would. Download and print these guys, compliments of Wild Olive. these are adorable! just found your website and I too love orange and your website is so fun! Those are so cute!!! Thanks for sharing. Those are adorable! Thank you! You are always so full of fresh and fun ideas. Love this one. Making something 'ordinary' into extraordinary is what it's all about. They're very cute, and they'd be handy, too! I do believe my jaw dropped when I saw my little bobbins on your much loved blog. Thank you! Way too cute. They would tempt me to run out and buy embroidery thread just to wrap around them, if I didn't already HAVE embroidery thread. Which I do. Thanks!! Mollie, thank YOU for making this cuteness for us! My eyes have suddenly been afflicted with a spontaneous case of extreme exposure to cuteness!!!! Oh dear. You're going to need to seek immediate treatment for that. Go look at something ugly, fast. this is just creepy...or magical. I was just lamenting today the mess that is my embroidery floss plastic ziplock baggie. And then this, as if written *directly* to me. And dang, but those are cute. Thanks so much for the wonderful things you find out their on the net and share with everyone. They're so sweet!! Thanks for sharing! Sooo cute, Thanks for sharing! Oh my goodness! These are so cute!!!! Great stuff, and I just got new ink for the printer too :-) Yaaaay! Yay! I love these. They are just the inspiration I need to organize my very messy floss box. So simple and so cute! Hi Jessica, thanks for sharing all your great finds! Those are very cute! Thanks! 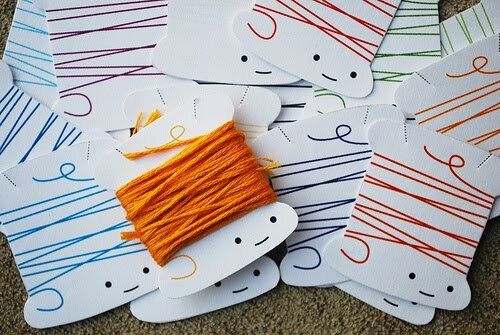 I never would have guessed that embroidery cards could be so cute! Where did you find this idea? Wow, just what i needed, thank you! Thank you so much! I just LOVE them!! These are so cute! Perfect for my daughter and I. Thanks for sharing! Adorable! All of my thread is indeed stored in ziploc bags(I'm embarassed to say.) I'm now inspired to get organized! these are way too cute! make sure you print them out on HARD card stock or cardboard, don't want the little guy to bend while you're wrapping him! AWESOME. thanks for yet another inspiring object to make. my craft room thanks you. These are the cutest things ever! I love all the different colors and the sweet faces! Another must-have-link via your Blog. I liken to come everyday and see whats new. These are too cute! TFS!! Brilliant! My stash is in desperate need of unsnarling. Gosh, I've been looking for something like this for ages. Thank you for sharing this link Jess! Yo are the best. Totally need to print these and untangle my threads!!! Thanks for this great find!